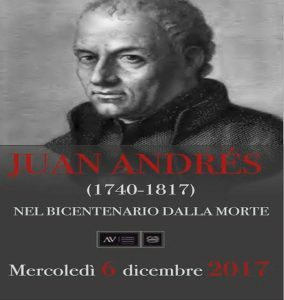 On December 6, 2017, the Accademia Nazionale Virgiliana di Scienze Lettere e Arti hosts a conference to mark the bicentennial of the death of Jesuit scholar Juan Andrés (1740-1817). Andrés, born in Spain, was a prominent Christian humanist and literary critic. The conference in Mantua, Italy features nine presentations over two sessions. A program, appearing below, is available online.